Who doesn't love a good nut joke? Doug's Nuts call out to the snickering kid in all of us with their interesting directions for consuming their product: Place Doug's Nuts gently into warm, expectant palm. But jokes aside, there's nothing childish about snacking on nuts! In fact, it's downright healthy. Doug's Nuts come from the small startup of Happy Nibbles, located in Eugene, Oregon. According to their website, many of the nuts used in the mix are local to that area. The mix contains almonds, peanuts, hazelnuts, walnuts, cashews, pumpkin seeds, and pecans, and they are flavored with vanilla, honey, and oatmeal stout. Most importantly, I want you to know that this sample was sent by Doug's Nuts for review. Eating in small handfuls, I could mainly taste the peanuts and hazelnuts, but also the vanilla in the glaze. Still, the best way for me to tackle a product like this is to go through each nut, one by one, because that's how I usually eat mixed nuts. The pumpkin seeds were green and wonderful. They had a slightly sweet, toasty flavor that went very well with the slight saltiness and subtle caramelized flavor of the glaze, and I loved the vanilla aroma on the finish. The seeds were mild with a lovely crunch – I could eat a ton of these. 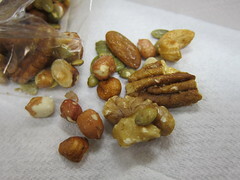 On that note, the almonds were also one of the stand-out nuts in this mix. They were plump and had just the right crunch, and the mildly woodsy flavor was also excellently matched with the glaze. The slight saltiness from the sea salt was perfect! Walnuts have an earthier, slightly bitter flavor that almost overpowered the subtle seasoning in this mix. Walnuts aren’t my favorite, but they were done well here. In this mix, the cashews didn’t blow me away. They were good, but not outstanding like some of the other nuts. I suppose I was expecting them to be crunchier, and the glaze seemed to add less here. The pecans were excellent – I really got a sense of the vanilla and oatmeal stout in the glaze, and the texture was lovely – nice and crunchy! Wow – can I make a pie out of these? Full disclosure – I just don’t care for hazelnuts, but that’s how mixed nuts go, isn’t it? The glaze went well with the strong, earthy flavor, and my husband loved them. He’s the hazelnut lover in the house, so please take his word for them. In this mix, the peanuts were very earthy and flavorful (but not bitter). They were extremely well-roasted, noticeably better than the average peanut! The seasoning was just a bit player for the peanuts, but I was okay with that because the nuts were toasty and wonderful. Both my husband and myself really enjoyed this mix. He liked every nut and ate handfuls at a time, whereas I ate around the hazelnuts (and sometimes the walnuts), but that's just my personal tastes. The subtle flavor of the glaze was just lovely, rounding out a tasty, filling snack. 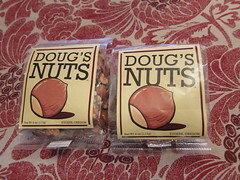 If you try Doug's Nuts, I don't think you'll be disappointed. Bahaha, I keep reading about how much you love Doug's Nuts. SNORK. I'm such a perv.